When is Yes not Yes? That is a matter of much discussion. Popular opinion would have you believe that any time Jon Anderson is not in the band, it’s not Yes. Similar claims have been made for Steve Howe and Rick Wakeman. And since the untimely death of Chris Squire – the only member to appear on ALL the albums – one gets the sense that Yes is no more. But not really. Various members have joined the band, left the band and in some cases re-joined the band, weaving a musical tapestry that is both rich and complex. Yes has always had great musicians. They were lucky in that regard. But there are now no longer any original members in the band. So is Yes still Yes? Well, yes if you ask me. It’s always been about the music with these boys. None of the members ever got arrested, caused a scandal or paraded their private lives in public for all to abuse. Rick Wakeman was perhaps the only “rock star” in the band and managed to grab his fair share of headlines, but he was the exception. It always came down to the music. And what music it was and is! When I was a teenager, waiting for a new Yes album was like waiting for Christmas – it just couldn’t come fast enough. And then there were the tours. Yes was the first group to appear “in the round” utilizing a revolving stage that made every seat in the house a great one. I think I have seen Yes about ten times over the years; all were great concerts. Yes, Wakey occasionally cuffed a note and Anderson frequently forgot the lyrics, but it didn’t matter. The audience knew it was in the presence of greatness. But the band is aging. 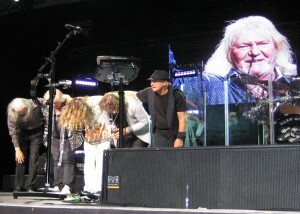 Steve Howe is 68 and Alan White is 66, and they are now the longest-serving members of the band. It was Squire’s goal to keep playing into his 90s, but Leukemia put an end to that. The current version of Yes is still musically formidable and entertaining, and as long as the fans feel they are getting their money’s worth, there is a reason for them to be. If and when Howe and White retire, the dynamics will change completely – but I get the sense that isn’t going to happen anytime soon. Previous Article← MY AUDIENCE WITH THE POPE OF TRASH!